Thank you to everyone who visited our booth in VIU’s Academic Fair at the new campus on Village Drive. 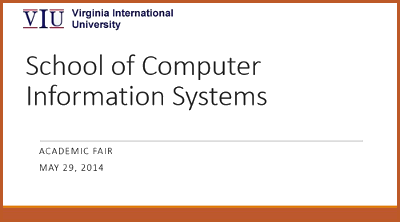 I hope you were able to learn more about what the School of Computer Information Systems has to offer. Also thank you to those of you who attended Dr. Saiid Ganjalizadeh’s presentation. In case you missed it, Dr. Ganjalizadeh discussed at length the benefits of majoring in computing, the different types of computing disciplines, and job opportunities related to these disciplines. In addition, Dr. Ganjalizadeh outlined our SCIS programs and—citing notable companies that SCIS alumni have entered since graduation—demonstrated their outcomes. Please visit us again at the next Academic Fair!